January 2015 saw above-average amounts of sunshine and rainfall right across the UK, but with temperatures averaging out to near-normal. The first half of the month was largely unsettled, with mild, wet and windy weather interspersed with colder and drier spells. From mid month, the colder conditions turned more persistent, with snow in places and some extensive snowfalls across the Scottish mountains. This change of weather type led to some large temperature variations through the month, with a high of 16.5C at Exeter Airport on the 9th and a low of -13.7C at Loch Glascarnoch on the 19th. Even though Loch Glascarnoch is in the Scottish Highlands and so is prone to very low temperatures in the winter, this was the lowest temperature recorded across the UK since 2012. Rainfall amounts were above average across the UK, especially so in Scotland where it was the 4th wettest January in the series since 1910. Shetland was particularly wet with Lerwick recording over twice the average rainfall; it was the wettest January here in a 100-year series. Conversely, sunshine amounts were also above average. Nottingham, Waddington and Dyce each recorded their sunniest January in over 60 years of records. Across the UK, it was the fifth sunniest January since 1910, with 60 hours of sunshine (compared to an average of 47 hours). Despite the cold end to the month, temperatures for the month as a whole were very close to average, with a mean temperature of 3.7C across the UK (just 0.1C above the 1981-2010 average). 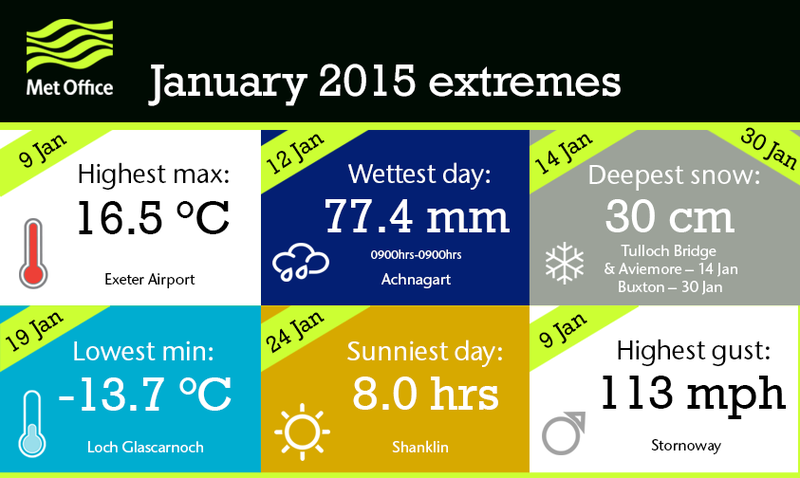 You can find out more about the weather in January 2015 on the climate pages of our website. This entry was posted in Met Office News and tagged 1981-2010 average, cold, dry, january, mild, record breaking, records, snowfall, sunniest, sunny, wet. Bookmark the permalink. Reblogged this on the WeatherAction News Blog. Record January maximum temperature at RAF Leeming in North Yorkshire, 14.7 C on Friday 9th January.